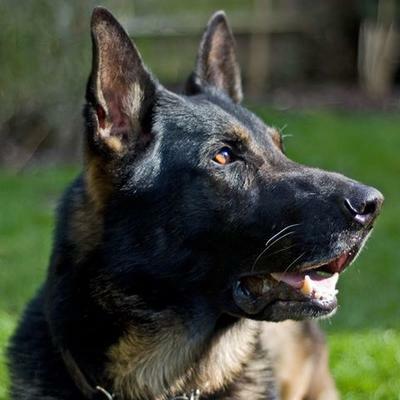 Thames Valley Police Dog Oscar was born in Jan 2003 and recruited to TVP as a police dog with handler Paul Nally. Oscar had an outstanding career for over 7 years, in that time he saw his CV reach the 600 arrest mark, with over 300 of the arrests down to his own work. Oscar had a natural ability to use his nose from a young age and this saw him successfully track many criminals and find many articles of property in his career. He was awarded an area, head of department and a chief constables commendation during his career in the police. I took Oscar for his retirement where he spent 2 years with me on the farm, he was still gently trained in protection work for me and the family, his transition into his new life with us was hard work for a month or so, but he quickly became one of the family, was very amenable,safe and a very charismatic dog. Myself,my family and his handler Paul were very sad to lose him and he has left a big gap for all of us. So sorry to hear of the loss of your beloved Oscar. It sounds as though he led an exciting life however, and filled an interesting role as both police working dog and companion dog. But it is never easy to let them go. Feel happy that you had the opportunity in sharing 2 years of his life with him and providing him a stable transition home as he re-entered civilian life. I wish you and your family and all the friends of Officer Oscar nothing but the best in the future. I hope this is as smooth a transition as possible into life after Oscar but he will always live on in your hearts! What a Great tribute to this Incredible and Handsome Police K-9, Oscar. He served his community proudly with all his achievements and commendations, truly a Top Dog! How lucky for both of you to have Oscar in his final years and to be part of your family and enjoying a well deserved retirement. God Bless Oscar, German Shepherd Police Dog!